More targeted investment, and closer co-operation between London and its surrounding regions are essential, if the capital’s continued expansion is to avoid stretching Kent and other counties’ infrastructure beyond breaking point. This was a central message for those attending Kent Design’s ‘Designing Kent’s Infrastructure’ conference on 19 November, which heard from a wide range of public and private sector speakers. Chaired by Chris Lamb (Director, Design South East), the conference began by placing Kent’s infrastructure demands into their political and demographic contexts. Cllr Mark Dance (Cabinet Member for Economic Development, Kent County Council) welcomed the audience. A challenge for him and his colleagues was how, for instance, to address the huge differential between east and west Kent in the face of major public spending cuts? Austerity means that investment will need to be targeted much more carefully. An ageing population increase puts demands on infrastructure acute hospital beds for instance, while creating further challenges to provide more health and social care infrastructure. KCC will continue to work alongside the private sector – as at Discovery Park – to deliver commercial infrastructure, although demand is currently outstripping supply. Tom Venables (Director, Design, Planning and Economics, Aecom), said that while Kent’s challenges could only be understood and addressed in relation to London and the greater south east, a lack of proper strategic thinking outside the capital about planning and infrastructure was hindering growth. Net migration from London to Kent is a growing trend, yet a vacuum in terms of preparing and updating local plans is failing to address an acute housing shortage and the needs of an ageing population. It was time, he suggested, for housing to come within the remit of the National Infrastructure Commission, and for local authorities’ duty to co-operate to be replaced with a more robust need to collaborate. Alexander Jan (Director City Economics, Arup) described the preparation of the London Infrastructure Plan. Seeking to build a narrative around infrastructure that extends beyond provision of physical infrastructure to encompass quality of life, he and his colleagues examined a range of issues including transport, aviation, green space, sustainable drainage, energy, digital connectivity, waste and housing. The capital requirement to deliver adequate infrastructure would be around £1.3 trillion, of which £1 trillion would be required simply to renew and maintain existing systems. As net migration from London into Kent continues to grow, the delivery of quality infrastructure in Kent becomes an ever more pressing need, if Kent residents are not to feel disadvantaged as pressure continues to grow on public services. While wholesale reform of governance across London and the south east may be a solution, political realities mean that existing arrangements will have to be gently tweaked rather than fundamentally reformed. Katie Stewart (Director of Environment Planning and Enforcement) agreed that growth can be a concern for existing communities, faced with local infrastructure that is already under strain – but that there is an opportunity to get infrastructure right if properly planned and understood. She presented Kent and Medway’s answer to this need – the Kent and Medway Growth and Infrastructure Framework (GIF). The GIF is a living document – informed by local authorities – that is mapping infrastructure needs across Kent and Medway to 2031, looking at costs, and examining how the public and private sectors can bridge gaps in provision or funding. The GIF shows that funding gaps exist in most areas of infrastructure provision, and are particularly acute in relation to transport, flood defences, libraries and sport facilities – all vital to accommodating quality growth for both existing and new communities. Set against a total infrastructure funding cost of £6.7 billion, there is an estimated £2 billion funding gap. How can it be filled? The solution will be a combination of lobbying central government for flexibility over infrastructure funding, potential reform of the Community Infrastructure Levy and other developer contributions, greater private sector investment in infrastructure, more targeted spending (e.g. by utility companies), and a focus on design quality to enable greater value for money. Central government is certainly alive to the infrastructure challenges facing Kent and elsewhere, said Fionanula Lennon (Area Coordinator, ATLAS, Homes and Communities Agency) as she introduced the work of ATLAS (the Advisory Team for Large Applications). Picking up Tom Venables’ point, she said that local plans need to offer a far more integrated, robust and flexible approach to infrastructure. Good practice identifies critical and essential infrastructure, examines timing and phasing, balances flexibility and certainty, demonstrates a partnership approach to infrastructure delivery, builds flexibility into planning application processes, includes contingency planning, and sets out clear road maps for delivery. And that good practice is already evident elsewhere in the country – for instance in Essex where Colchester, Tendring and Braintree district councils are thinking together about how a garden city approach might address their shared housing and infrastructure needs. In Cranbook in East Devon, strong working partnerships between the public and private sectors are unlocking vital funding and support. The conference’s second session moved from the political, economic and demographic contexts and examined how design and infrastructure could be better aligned. Starting this session, Rosemary Redmond (Environment, Planning and Engagement Manager, Environment Agency) provided an overview of green and blue infrastructure. Both green infrastructure (e.g. sustainable drainage, wildlife habitats, green corridors) and blue infrastructure (water quality, surface water treatment, flood defences) are vital considerations in any case when addressing housing demand, and can unlock previously unusable sites such as flood plan location. Developers and local authorities, however, need to pay heed to the NPPF’s key phrase: “care should be taken to ensure risks can be managed through … green infrastructure.” As well as unlocking land for development or increasing values in depressed areas, well-designed green and blue infrastructure development can lead to greater productivity as people move to more attractive places to live and work. To succeed, blue and green infrastructure needs to be considered not only at the early stage of local plan preparation, but also when masterplanning large sites. The Kent and Medway GIF offers a fine opportunity to inform such an approach. An inspiring presentation looking at how well-designed rail infrastructure can deliver huge public benefits was given by Bright Pryde-Saha (Deputy Secretary, Independent Transport Commission). Cities such as Antwerp and Rotterdam had enthusiastically seized the opportunities offered by high speed rail infrastructure to deliver benefits that went beyond well-integrated transport systems. Antwerp had redefined itself as a great (and well-connected) meeting place and destination, while Rotterdam had gone further by knitting a variety of cultural and civic activity into its central station district, transforming the station and its environs into a fine civic asset. As other European cities such as Utrecht and Bordeaux seek to capture the additional value from transport infrastructure, the message to the UK was clear: don’t let London King’s Cross be an exception – use the opportunities of high speed rail to go beyond improving connections and deliver high quality public realm infrastructure. Successful transport-led masterplanning is no different from any other kind: the most sustainable approach is to build beside what is already there. This was the key message of Neil Bennett (Transport Planner, Farrells) as he offered insights five years after the commissioning of 21st Century Kent by Kent County Council. Just as Bicester Eco-Town succeeds because it can build upon existing infrastructure and bring benefits to new and existing residents and businesses, so should Paramount respond to the existing post-industrial landscape and settlement at Ebbsfleet. A final session looked ahead to future infrastructure development in Kent. A pressing need is for significant investment in digital infrastructure – a key task for Jeff Wallbank (Head of Kent Public Service Network, Kent County Council). Despite huge existing use, growing demand for high speed internet connection, and the Prime Minister’s call for internet provision to be a universal service, parks of Kent remain poorly provided for. Kent County Council is working with BT and BDUK to increase access to high speed broadband for 30,000 properties not currently being addressed by the market by 2018, through a £100 million project that will use other means such as satellite broadband where fibre connections are not possible. The Kent Public Service Network continues to fulfil its remit to connect all public sector users in Kent and to improve the county’s digital infrastructure. Nevertheless, and future infrastructure investment in Kent must consider whether improved internet connectivity can be included in such programmes. Social and health care infrastructure is as critical as housing, environmental and all manner of physical infastructure, claimed Robert Stewart, Clinical Design Director and Anne Tidmarsh, Director of Older People at Kent County Council, as they described the Kent Integration Pioneer – a programme initiated by the Kent Health and Wellbeing Board in 2013. Encompassing public and voluntary sectors, the initiative is enabling better access to healthcare via co-designed integrated teams working 24/7 around GP practices. A strong focus on home-based self-management and self-care through technology is improving patients’ personal experience and independence, and is allowing people to feel safer for longer at home, thereby reducing pressure on emergency services and traditional social care facilities. A further strand is examining supported living environments to provide high quality care and tackle isolation. The scheme is looking to become a national test bed, and its organisers are disseminating their work and experience across the NHS and among citizens, academia, business and industry. As the programme continues to develop and empower people within their own homes it raises the question – is there a role for architects and engineers to inform how the NHS is run? In considering how sustainable infrastructure can be delivered within existing systems, Tim Allen (Partner, Peter Brett Associates) called for flexibility and an end to silo thinking. Designing infrastructure elements in isolation leads to failure and insensitive design, and fails to build in the resilience necessary to accommodate future, unseen, demands. King’s Cross Granary Square, where new public realm infrastructure was specified from the start to be inherently flexible to accommodate future uses and configurations, was cited as a good example; while Ebbsfleet, where infrastructure has not been properly addressed in the past, was somewhat in need of improvement. Alongside better forward thinking and a willingness to embrace ideas, infrastructure planners should look at other finance models – such as variants of the tax-efficient municipal bonds commonly used by state authorities in the United States. 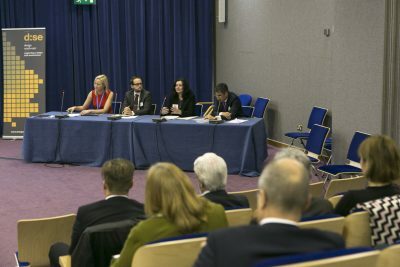 The conference’s final speaker, Louise Wyman, Director of Strategy at Ebbsfleet Development Corporation, agreed that Ebbfleet faced considerable infrastructure challenges. These include the cost of land remediation s.106 obligations, the legacy of piecemeal approaches to utility provision, capacity constraints (e.g. waste water), and traffic congestion. Addressing these challenges will need a thorough understanding of issue such as the area’s topography and geology, an ability to work with and around existing planning consents, close co-operation between public and private sectors, and sensitivity to the needs of communities beyond Ebbsfleet itself. In Ebbsfleet’s post-industrial landscape, the new “garden city” will be quite different to Letchworth. Summing up, Chris Lamb invited participants to consider three issues as they left: what is the infrastructural relationship between London and Kent? Who should carry the risk, and when? And finally, what lessons can we learn from Europe in delivering the invisible infrastructure that makes places happen.